Two special agents are patrolling the isolated deserts of New Mexico, when suddenly, their car, the radio, and everything around them shuts down and they are overwhelmed by the intense white lights of a spacecraft landing exactly in front of them. A strange creature exits the equally strange craft and, after a sort of smile, it moves closer and speak directly to their minds, warning about an ancient, predatory alien race, who scoured the stars and prepares to attack Earth. To face this threat, the Agency starts to recruit and train agents for an elite squad, ready to engage the hostile aliens with no mercy. They are the Galaxy Defenders. This is the starting point of the new cooperative, tactical game, inspired by the Sci-Fi cult movies from 80s and 90s, Galaxy Defenders. 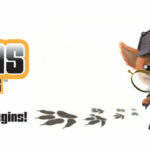 The players (1 to 5) will join a secret agency responsible of detecting and stopping alien activity on Earth, getting involved in critical, tactical missions. 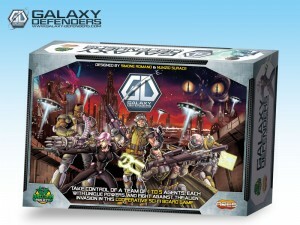 Galaxy Defenders: cooperative and tactical game for 1 to 5 players. 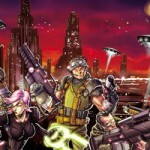 Each player takes control of one agent with unique powers to defend the planet from the alien invasion, gaining experience during missions. Agents improve their profile with multiple skills, basic and improved tactics, and the ability to use new devices such as advanced human weapons and alien technology. The aliens are controlled by the game system itself, through an artificial intelligence (A.I.) 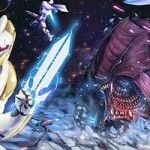 system which gives different behavior to each alien species, and also represents the chaos of battle. The battle is carried out in a completely story-driven campaign, with each mission having multiple endings and whose outcome changes the flow of the Story. In the beginning, no one really believed in the aliens, even if the Agency was recording an unusual number of unidentified flying objects, with numerous people calling the cops, and the cops calling the Agency. 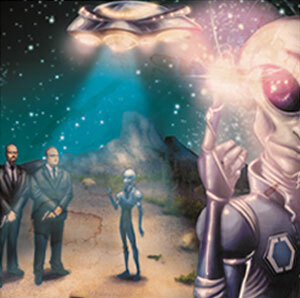 Until the night when Agent S and Agent N had a close encounter with an alien in the New Mexico desert. The agents didn’t see the spacecraft coming until the bright light slammed them on the ground. A strange noise, sort of hiss, like the breath of a gigantic dragon, and then a constant, low humming buzz filled the air. Something moved inside the lights, and an airlock flew open. A humanoid creature stepped out, wearing a strange metallic outfit, which reflected the lights of the craft. It wore gloves which emitted strange reflections, almost lights themselves. The boots were made of the same material and it wore what appeared to be a breathing system, or a backpack, or something else, on its back. Its head was bare, light grey in colour, with distorted human-like appearance, and large, black and deep eyes. The alien appeared to be friendly, smiling and getting closer to the agents with outstretched hands. Then it spoke, but it never made a single noise nor opened its lips. Using telepathy, it talked about an evil alien race seeking out new worlds, attacking them, taking whatever they want. Sometimes, they leave the planet with some intelligent life form as survivors, but most often, nothing remains. This race has advanced knowledge and abilities. They can merge flesh with metal, create living machines, and even tinker with DNA - or whatever else they have in their cells. They are capable of using powerful energy devices to move from place to place. They can even teleport. They have weapons and armor of incredible power and efficacy. And, the worst part, they're coming to Earth. But then, the alien said something else. This wicked race has enemies and the enemy of our enemy is our friend. These friends were willing to help, and they did so by helping to set up the Galaxy Defenders. They gave us some "toys", some advice, things to fight fire with fire. The invaders could be surprised, knocked off balance, hit hard, and repelled. Maybe even defeated. The alien said if we were well enough prepared, we could be ready for them and kick their biomechanical butts off this planet. Since that day, these grey friends come and go, helping the Agency in training, but never too directly.